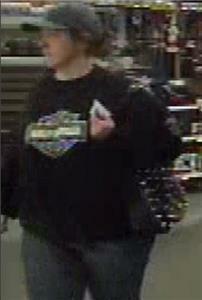 The Dalton Police Department is asking for the public’s help with identifying a woman who tried to use stolen credit cards to buy two TVs at Walmart. The transactions were declined. The incident happened on Jan. 26. The victim in the case was running errands at several stores and realized at some point that she’d lost her wallet at one of the stores she visited in Dalton, but she was unsure which one. Soon after, the victim was contacted by Discover and also Capital One informing her that two of her credit cards had been used at the Shugart Road Walmart in an attempt to buy two large flat screen televisions. Both transactions were declined by the credit card companies. A Dalton detective was able to retrieve video of the transactions and found images of the suspect. 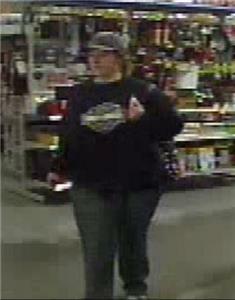 The suspect is a heavy set white woman who wore jeans and a black Harley Davidson t-shirt with a baseball cap that appears to be dark green or possible camouflage. Pictures of the suspect are included with this release. Anyone who knows this suspect’s identity or has information about this crime is asked to contact Detective Jacob Burger at 706 278-9085, ext. 9325.